ScanGauge Automotive Computer provides realtime feedback while simultaneously tracking three sets of trip data. The Digital Gauges give you realtime data for your vehicle and the built-in Scan Tool allows you to read trouble codes and diagnose potentially expensive problems before they get out of hand. Do you wish your car displayed things like; MPG, max speed, average speed, and distance to empty? With a ScanGauge all of these measurements are available in real time along with many other features and statistics. The ScanGauge also allows you to view and reset error/trouble codes that cause the check engine light to come on. For easy operation the ScanGauge has a large screen, backlight, custom backlight colors, making it virtually fully customizable. The gauge is a great addition to any vehicle, and will work on any 1996+ OBDII car. 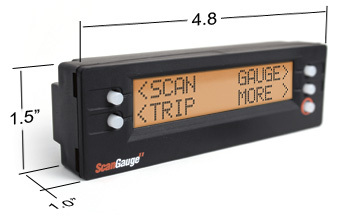 The ScanGauge is able to display up to 4 of a possible 12 gauges at one time. The gauges can easily be customized to display what you would like to see on your ScanGauge. All the optional display gauges are displayed in real time. The ScanGauge will work with Most OBDII 1996+ vehicles including; gas, diesel, hybrid, and propane powered vehicles, please see compatibility guide below. If I purchase a new ScanGauge does it include the Add-A-Gauge and XGauge software? Yes, any newly purchased ScanGauge will include the latest version of software including Add-A-Gauge and XGauge. Will the ScanGauge II work on my vehicle that was purchased outside of the US and Canada? The ScanGauge requires the vehicle to be either OBDII or EOBD compatible. In the US and Canada, cars and light trucks were required to be OBDII compatible starting in 1996. In Europe, EOBD was phased in between 2002 and 2004. Other parts of the world have required one of them starting in various years. Many vehicles made and/or sold outside the US and Canada had one of the protocols before they were required in that country. This was to allow sales to other countries and because they knew they would eventually be required to meet the requirements and designed it in when they redesigned a particular model. There is no comprehensive list of when particular vehicles began using OBDII or EOBD outside the US and Canada. trouble codes and turn off my "Check Engine" light? The ScanGauge II will clear the codes and turn off the check engine light on 99% of 1996 and newer vehicles. It has been reported that it can not do this on some trouble codes in the Dodge vehicles. things with only a single connection to the vehicle? 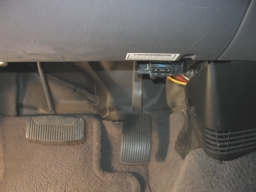 ANSWER: Since 1996, all cars and light trucks sold in the US have been required by law to have an On-Board-Diagnostic version 2 (OBD2 or OBD II) connector inside the passenger compartment. It is required to provide diagnostic information and allow resetting of the CHECK ENGINE light. It also provides a lot of other operating information. The ScanGauge II performs the diagnostics functions like a conventional scan tool. It also goes beyond this and uses the other data to add many more useful functions. Do I need to know what Protocol my car uses? No. The ScanGauge II automatically determines which protocol your vehicle uses and switches to it. Can I use the ScanGauge II on more than one car. Yes. There are no restrictions on moving it from car to car. Can my 1995 Ford Mustang use it? Maybe. Some 1995 and even some 1994 vehicles are OBD2 (sometimes shown as OBD II) compliant. Look at the emissions stickers under the hood. If you find one that says OBD2 or OBD II, you should be able to use the ScanGauge II. Can I use the ScanGauge II to tell how fast and how far my teenager drove the car last night? Yes. This information is stored in the trip computer and it can be recalled by you for up to a day after he used it. What if my child disconnects the ScanGauge II while they are using the car. If the ScanGauge II was disconnected during the trip, a disconnect indicator will be displayed in the trip data. My speedometer only goes to 90MPH. Can the ScanGauge II show speeds above this? Yes, the ScanGauge II can show speeds up to 158MPH. Can I tell how high the coolant temperature has been getting on my wifes car? Yes. The maximum coolant temperature is stored by the trip computer and can be read back by you later. Can I use the ScanGauge II to save fuel? If your car reports information on fuel consumption (99% of cars and light trucks do), and you use it to adjust your driving habits, you can save a lot of fuel. Do I have to reset the trip computers for each trip? No. The CURRENT trip can be reset manually if you desire. It is automatically reset after the ignition has been off for more than a few minutes. The DAY trip will accumulate the entire days trip information and reset itself after the ignition has been off for more than 8 to 9 hours. The DAY information is moved to PREVIOUS before it is automatically reset. The MPG gauge reading changes very quickly with slight changes in throttle or load. Can I smooth this out to better determine the affect of speed on fuel economy? Yes, use the TRIP MPG function in the CURRENT mode. After reaching the desired speed, reset the TRIP. The average MPG since it was reset will be reported. Can the ScanGauge II show if there is a difference in MPG between using my truck with the tailgate up or down? Yes. See Tailgate Up/Down and Gas Mileage. The ScanGauge II shows a trouble code of E0468. How do I figure out what this means? There are many sources to decode this. A search of the internet for Trouble Codes for your particular vehicle is a great way to get them. Print them out and keep them in the car for future reference. You can also find them in the vehicle shop manual and after-market service and emissions manuals. What is FRZD in the ScanGauge II? When a trouble code is set, the data at that time (RPM, Coolant Temperature, Speed, Throttle Position, etc.) are captured like in a freeze frame. FRZD can be used to recall this data to help diagnose the problem. What are the dimensions of the ScanGauge II? The ScanGauge II is 4.8"Wide, 1.5"High and 1.0"Deep. When I press SCAN it says -Not Ready- in the lower line. How can I tell which OBD test has not been completed? There is a way to do this using the CMNDS feature in the ScanGauge II. See Finding Incomplete OBDII Tests Using the ScanGauge II. Can I purchase an extra cable to use in another vehicle? Does the ScanGauge II support metric units? Yes, the units of measure can be independently selected between Miles/Km, Gallons/Liters, Celcius/Fahrenheit, and PSI/KPA. If you choose Km and Liters, fuel economy is reported as liters/100Km (LHK). If you use Imperial Gallons when you do the calibration, fuel will then be adjusted to use Imperial Gallons. What does the Cutoff function do? Some vehicles will turn the fuel injectors off when coasting down. We sense this with the open/closed loop indicator and the throttle position. We have to know if the throttle is opened or closed but the minimum value for it is rarely 0. The Cutoff is the value the throttle has to be below in order to indicate a fuel cutoff and show 0 fuel flow. The default is right for most vehicles, but it can be adjusted for different situations. If set to "0" it disables this method of fuel cutoff sensing. How do I find the plug to connect the ScanGauge II? The OBD2 connector is supposed to be located within 1 meter of the steering column. It is usually under the dash and just to the right or left of the steering column. Sometimes it will have a cover over its face. Other locations are under the dash on the passenger side under the dash, behind the ash tray and in a rare case, under the ash tray in the back seat armrest. The pictures below show the OBD2 plug in a typical location. You can take any of the trip values and have them displayed as a gauge. This allows you to monitor trip functions along with other gauge functions. Press EDIT, In the TXD screen, the first character determines which trip function will be displayed. The second character determines which trip to use. On the RXF screen that will come up next make the first character an 8, this tells the ScanGauge that the gauge you are creating is to be used as a trip gauge. All values after the 8 are ignored. Now you can select your new gauge just like any other one. From the home screen, press GAUGE press the button next to the gauge you want to use for the XGauge. Keep pressing as needed until your newly created XGauge name appears. You can have Horsepower read out on your ScanGauge as you drive. Using the buttons next to + and - after each character the -> in the top right will move to the next character space. You can add vehicle specific gauges to your ScanGauge. With today’s gas prices its more important than ever to have the best fuel economy possible while driving your Ford truck or suv. There are many products available which claim to increase economy but it’s difficult to gauge just how much they help. ModBargains.com sells the Scangauge II at a great price and this device will help you know how much a modification helps, and will also help to determine how changes in your driving habits impact fuel economy. I purchased 2 of the units – one for my truck and one for my wife’s minivan. If you choose you can purchase additional cables and use the Scangauge II in multiple vehicles, but I opted for 2 of them because I didn’t want to have to reprogram engine size and tank size each time I moved it to another vehicle. In addition to this, the Scangauge II product lets you track fuel costs and fuel usage, the ability to view 4 virtual gauges at once and read/clear OBDII diagnostic codes. It’s a universal device and works with most OBDII and CAN compatible vehicles. This includes all 1996 and newer light duty Ford trucks and suvs, 1994 and newer 7.3L, 6.0L and 6.4L Powerstroke diesels, and 1999 and newer gas powered Ford Super Duty trucks and Excursion. Installation is easy. Simply plug the device into the OBDII connector located under the driver’s side dash panel and then mount the gauge in a handy location. Do not locate it on or near air-bag surfaces! The Scangauge II is light and comes with a Velcro mount so you can mount it just about anywhere (the “Blendmount”, also available from ModBargains.com, allows you to permanently mount it above the rear view mirror). For my tests article I didn’t mount it but instead I had someone hold it and take photos while I drove. My plans are to fabricate a custom mount in my ashtray area in the near future. Once plugged in you set it up by turning on the ignition, entering your engine size, fuel tank size, fuel type and units of measure such as gallons or liters. That’s it! • Scan – This option displays any OBDII and CAN diagnostic codes. If no codes are present it will give a READY reading which means the vehicle should currently pass emissions testing. If any codes are present it will display them and give you the option to clear them. Open/closed loop, cost per mile, intake air temperature, coolant temperature, fuel pressure, gallons/liters per hour, ignition timing advance/retard, engine load, miles per gallon (or other units of measure), miles/kilometers per hour, manifold absolute pressure, RPM, throttle position setting and battery voltage. Additionally, the Scangauge II has the XGauge feature which allows programming of custom gauges for specific vehicles. One popular XGauge setup is the horsepower gauge and ModBargains.com includes detailed instructions on their web site for setting up this gauge on Fords. • Trip – This is by far one of the best features of the Scangauge II. It displays information about the current trip, combined trips for today and combined trips for the previous day. Each of these trip information screens can display maximum speed, maximum coolant temperature, maximum RPMs, average speed, fuel economy, miles driven, elapsed time, fuel used, fuel cost. There is also a “tank trip” which shows information since the last fill-up including fuel used since last fill-up, fuel remaining in the tank, distance driven, distance remaining, time driving, time remaining and miles per gallon. • More – This option leads you to sub-options such as Setup, Display (you can change the screen color to any one of 64 colors), Fillup and another More option. The fillup option screen allows you to enter data about the current fillup of the fuel tank. The Scangauge II automatically uses tank data to correct for any minor errors in mileage data. The more you use the Scanguage II the more accurate it becomes. My testing revealed that for my truck the “out of the box” mileage readings were very accurate (within ½ mpg) and that’s with a custom tune on a supercharged 5.4L V8. The More option lets you program custom gauges and other options. One of the options recommended is to adjust the mileage reading using a GPS unit or highway mile markers. This helps the unit correct for any errors in the factory odometer (most are slightly off) and allows the Scangauge II to display more accurate information about fuel economy. This is where it gets interesting. For this test I ran the truck like I normally do for a day with the Scangauge II hidden from view so it wouldn’t impact my driving habits. I averaged about 7.1 mpg city and 13.5 mpg highway. Roush’s EPA estimates for a Roush supercharged F150 is 8 mpg city and 11 mpg highway - yeah, its that bad! The Scangauge II has already proved itself to be useful because I now know for certain that the custom tuning done to the truck is not only improving power but its also slightly more efficient than Roush’s standard tune on the highway, and it indicates I may driving a bit too aggressively during city driving. With a few changes to driving habits the economy improvements were substantial. Read on…. 2. Anticipating stops and coasting to a stop from a further distance. 3. Watching my boost gauge (not part of the Scangauge II) and noting how much throttle (via the TPS display on the Scangauge II) resulted in full boost or partial boost. For non-supercharged vehicles watching MAP gauge on the Scangauge II can substitute for a boost gauge. I used this data to get a good idea of exactly how much throttle was required to keep boost slightly lower going up hills at the cost of losing a slight amount of speed going up hills. 4. On the freeway I drove close to the 70 mph speed limit (most of the time) because the feedback from the unit showed an improvement in MPG by doing so. 5. I coasted the last mile to my home when no one was behind me. 6. I still continued to have “fun” by getting into the throttle when a Mustang or other quick car was at a light, but I stopped driving as aggressively overall. How much did my mileage improve? I averaged 13 mpg city and 17.4 mpg highway. That’s very good for any 4x4 F150 Supercrew… its excellent for one that is supercharged. The Scangauge II has made a believer out of me. I’m sure with a little more time I can squeeze even more economy out of it while still enjoying the extra power the supercharger adds. Check out ModBargains.com to get one --- they have great prices, know the product well and I received timely support from their salesman Alon and his support made the purchase decision easy for me. If your experience with the Scangauge II and ModBargains is anything like mine you won’t be disappointed.